Dive In to the World of Digital Art and 3D Animation. 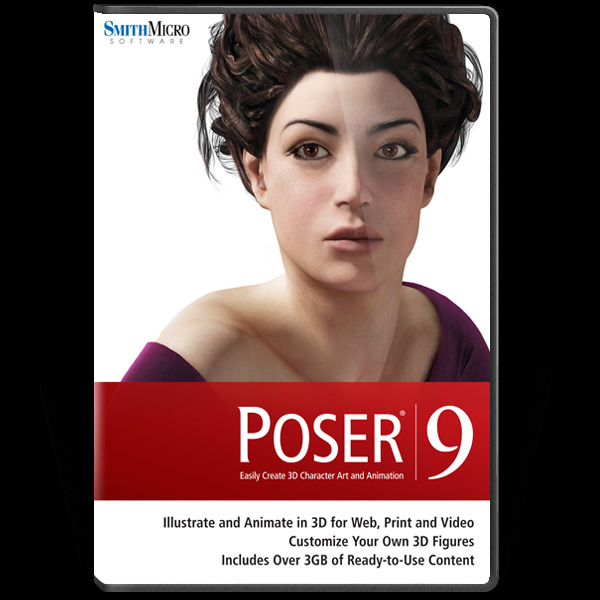 Poser comes with everything you need to create incredible digital art or 3D animation. 3D Characters, Animals, Vehicles, Props, Scenes, Cameras and Lights, all included! Poser is simple to learn, but powerful. Best of all, its fun. All that's needed is your imagination! 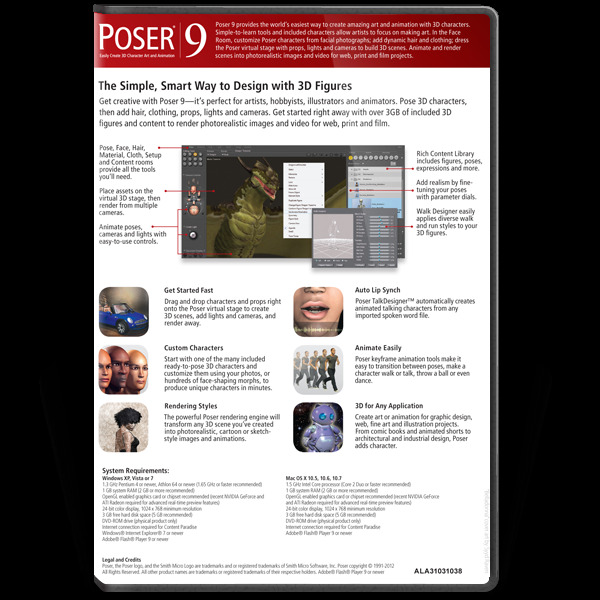 Poser 9 provides the world's easiest way to create captivating art and animation with 3D characters. Add 3D people and characters right from the library. Customize those characters using facial photographs, even add dynamic hair and clothing. Build a 3D scene on Poser's virtual stage with props and backgrounds. Arrange your lighting and cameras. Pose your figures joint by joint. Automatically generate walking or running animations or talking characters. You can even import motion capture files for more action. Animate your lights and cameras to tell the perfect story, then render scenes into photorealistic images or video for web, print, and film projects. Simple-to-learn tools and included characters let artists focus on making art. Poser comes with over 3GB of ready-to-pose humans and animals, textures, props and 3D scene elements. In the Face Room, customise Poser characters from facial photographs; add dynamic hair and clothing; dress the Poser virtual stage with props, lights and cameras to build 3D scenes. Animate and render scenes into photorealistic images and video for web, print, and film projects. Graphic artists, illustrators and animators can all get creative with Poser 9. Drag and drop characters and props right onto the Poser virtual stage to create 3D scenes, add lights and cameras, and render away. Poser Debut?s interface is very easy to master, even for complete beginners to 3D modelling and animation. Start with one of the many included ready-to-pose 3D characters and customise them using your photos, or hundreds of face-shaping morphs, to produce unique characters in minutes. Poser keyframe animation tools make it easy to transition between poses, make a character walk or talk, throw a ball or even dance. Poser TalkDesigner? automatically creates animated talking characters from any imported spoken word file. Create art or animation for graphic design, web, fine art and illustration projects. From comic books and animated shorts to architectural an industrial design, Poser adds character. 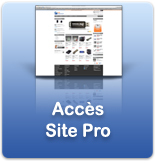 Logiciel Poser 9 en version Anglaise pour PC/MAC.